Summer may be drawing to a close, but road trip season is still in full swing. When you go on a regular vacation, you spend most of your travel time wishing that you were there already; but when you are on a road trip, the joy is in the journey. The best road trips are filled with food, friends, and fun conversation. And while this is a good thing, sometimes the amount of junk food that you eat on a road trip definitely is not. So to help you out with your next road trip, here are a few of the best ideas for healthy snacks on the road. Before you leave, pop a few bags of popcorn, and take some with you, stored in freezer bags. The best way to keep it healthy is to pop the kernels yourself, and don’t add any salt or butter. If this is too bland for you, sprinkle it with some salt. Sometimes the only popcorn you can get is ready-buttered microwave popcorn. If so, it is still low-calorie, free of artificial flavoring, and usually healthier than most other snack foods. If popcorn is not your thing, put together a few bags of your favorite cereals, and snack on them throughout the day. Jerky is rather high in sodium, so it is not something that you should eat too much of all the time, however the high protein and ease of eating means that jerky is a great food to eat when there is nowhere to stop for dinner. Again, this is a salty and high calorie snack, so not exactly a diet food. But as far as road trip foods go, it is a healthy way to keep yourself nourished in those hours between rest stops. Plus, it’s delicious! 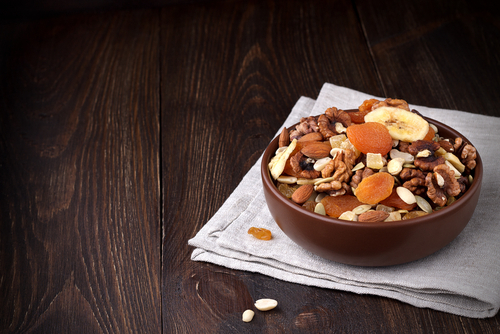 If you’re worried about the sugar in trail mix, perhaps pack just a few packets of nuts instead. As with the rest of these saltier options, they will no doubt have you reaching for the water, but when you are on a long road trip, you should be keeping well hydrated anyway. Just like nuts, sunflower seeds are a healthy way to snack, keep your hands busy, and most importantly keep yourself away from that bag of chips! A healthy staple, but not usually considered a road trip food, fruit is one of the best things that you can bring to keep yourself full throughout long hours of driving. If it is a long trip, and you are worried about it lasting, the good news is that most gas stations now sell a variety of fruit. Dried fruit is also a good option, and you may find that it leaves less mess in your car. If you are concerned about the potential mess that fruit might make in your car, or you don’t want to have to deal with leftover peels and rinds, vegetables are the perfect substitute. Pack some small bags of baby carrots, celery, broccoli, peppers, and any of your other favorite vegetables to munch on while traveling. Sometimes you do have to stop for meals and put up with whatever is available. Of course, this usually ends up being some kind of burger, hotdog, or other fast food or gas station delicacy. Shake things up by buying a sandwich or a bagel. This will be far less fat and grease to sit in your stomach for the rest of the journey. And when you do have to stop at a fast food restaurant, check the menu for any wraps they may have. These usually contain fresher ingredients, without the carb-filled, processed bun. For more great road trip ideas, don’t forget to check out our Road Trip Planner! It has all the best snacks, games, apps, and advice for your next road trip.